Used 2015 BMW M3 4dr Sdn for Sale in Denver CO 80220 Weisco Motorcars, LTD. Absolutely Stunning Condition! 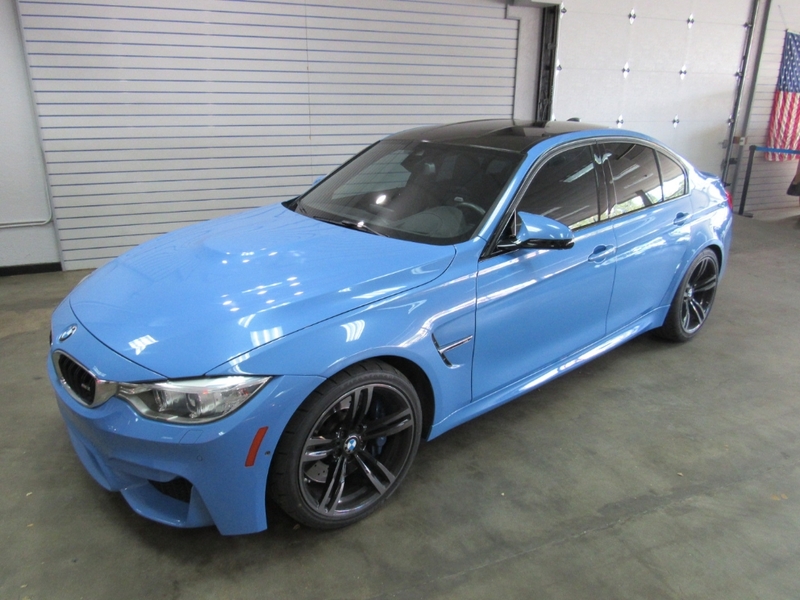 Fully redesigned in 2015, this BMW M3 sedan hard to find Yas Marina Blue Metallic ($550) over black leather and only 35k miles. This M3 is lavishly equipped--some of the major upgrades include: full Carbon Fiber roof, executive package $4,300 (parking sensors, heads-up display, heated rear seats, heated steering wheel, rear-view camera, and satellite radio) Driver Assistance Package ($1,900)(blind-spot monitoring, lane-departure warning, side and top view camera system, frontal collision warning and automatic braking for collision mitigation) Harmon Kardon 16 speaker sound system ($875) with bluetooth phone and audio connectivity (and HD radio and USB/iPod interface) heated seats, 19" black light-alloy double spoke wheels ($1,900), 2VF adaptive M suspension ($1,000), Navigation with real time traffic, keyless entry, Keyless go, Carbon fiber dash trim, power seats with memory system, xenon lights, and so much more. Has the 425HP Turbo inline 6CLY with 7-speed dual clutch SMG transmission ($2,900) that make for a very fast and fun car to drive that Motor Trend says accelerates from 0-60 in 3.8 second! The body and paint are in nice shape and looks fantastic with the blacked out wheels and Carbon Fiber roof. The inside is also in nice shape and has not been smoked in. Call Weisco Motorcars for more info or to set up a time to stop by for a look over this BMW M3 Sedan.